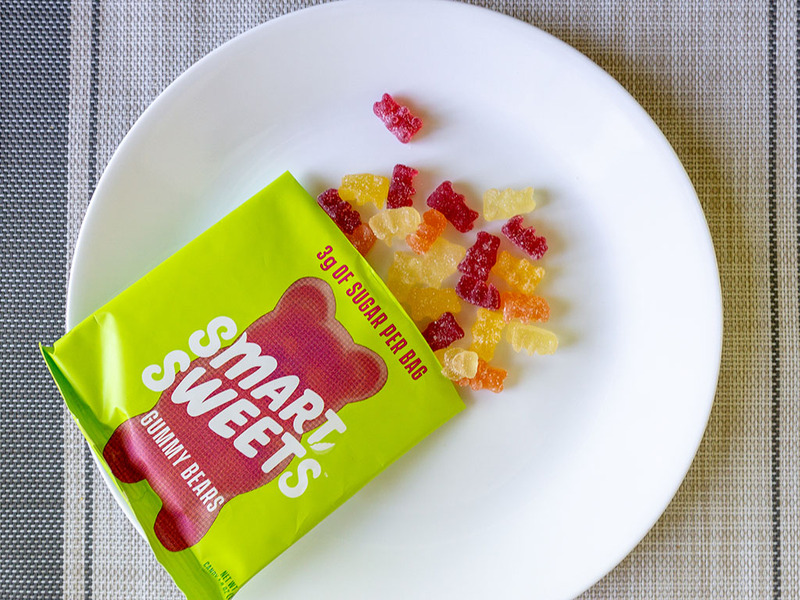 Are Smart Sweets Gummy Bears any good? Yes! 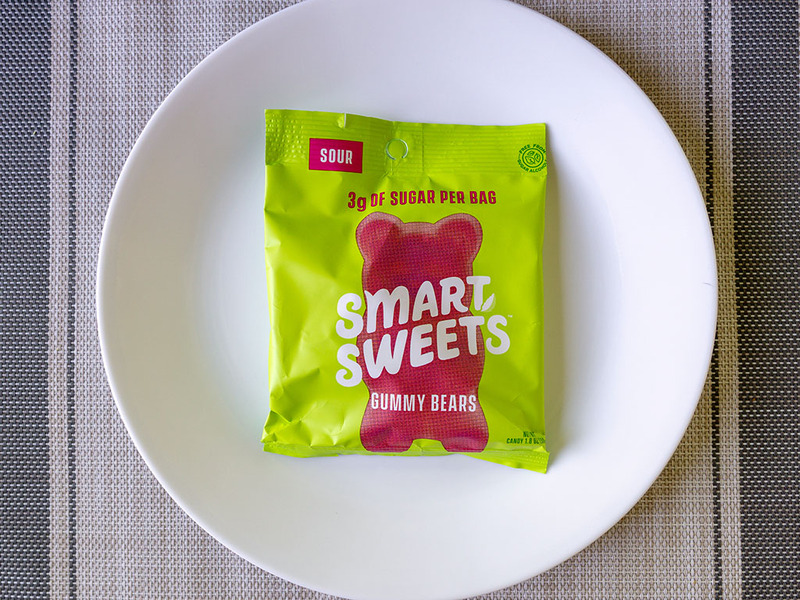 Each bag of these Smart Sweet gummies packs in an amazing 28g of fibre (less than 8g net carbs) and just 3g of added sugar. 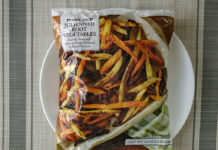 Texturally and taste wise they’re very close to regular gummies, the main difference here, one bag is just 90 calories and completely vegan friendly. Cost might be the only cause for concern in choosing this product. 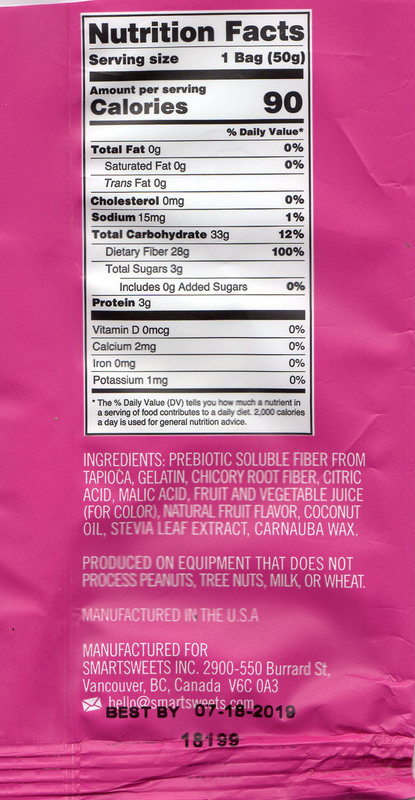 Ever looked at the back of a supposedly healthy product and burst out laughing? 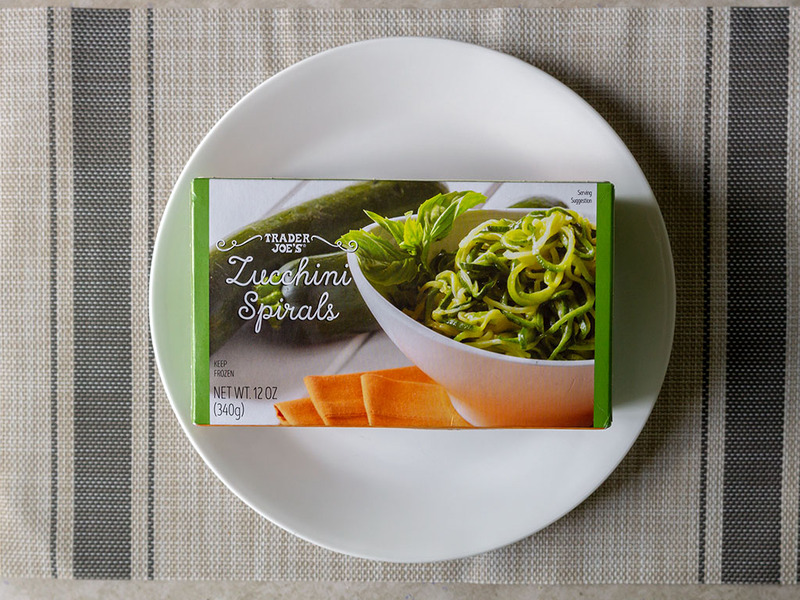 Sure a single serving might be just 50 calories, provided of course you abide by some ludicrously tiny portion size. 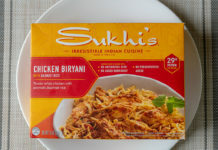 Invariably this is the way most products market themselves as diet friendly – just don’t eat more than a microscopic bite and you’re fine. 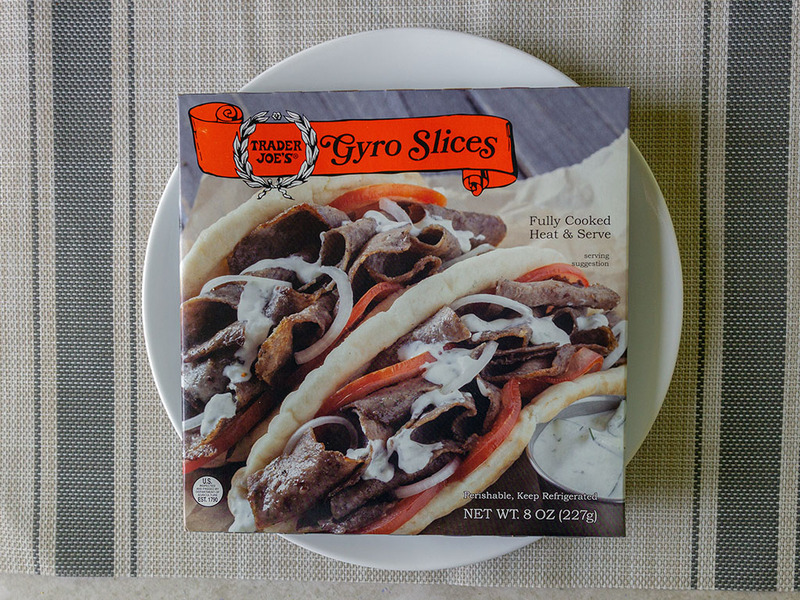 The flip-side is usually, “go ahead, eat as much as you like, just don’t expect a flavor you’ll actually like!” Those fun things like salt and fat and sugar are usually ominously missing when a packet gives you the go ahead to wolf down the whole thing in one sitting. It’s for these common reasons that I was less than enthused when I was contacted by the guys at Smart Sweets. 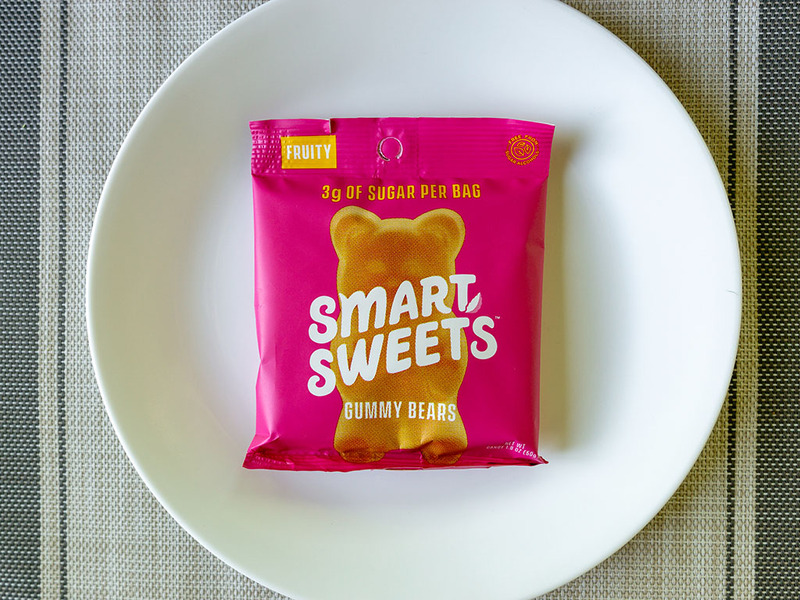 The marketing message behind Smart Sweet’s diet-friendly candy is essentially: yes you can have your cake candy and eat it too. Sounds too good to be true? 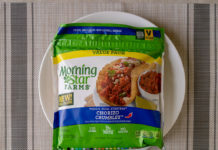 Well I have to confess I was happily blown away by this product. Healthy, check! Tasty, check! 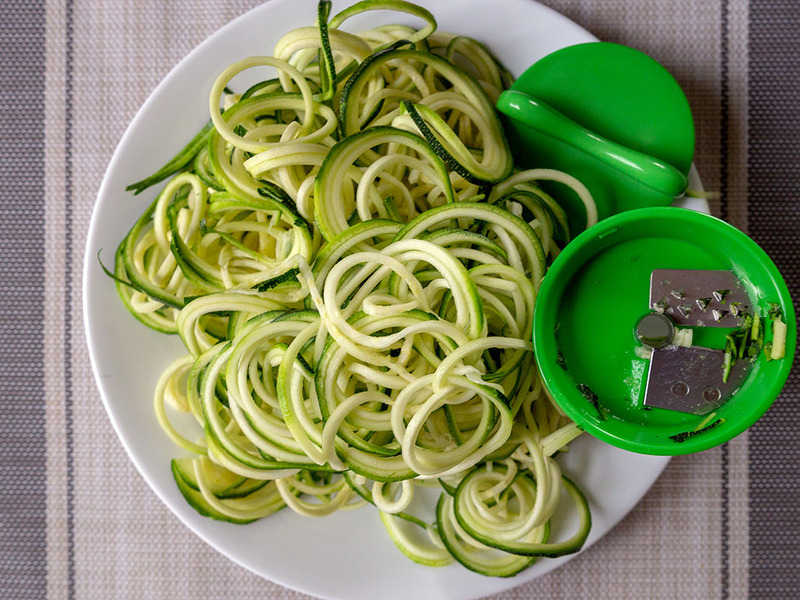 Can I eat the whole packet? 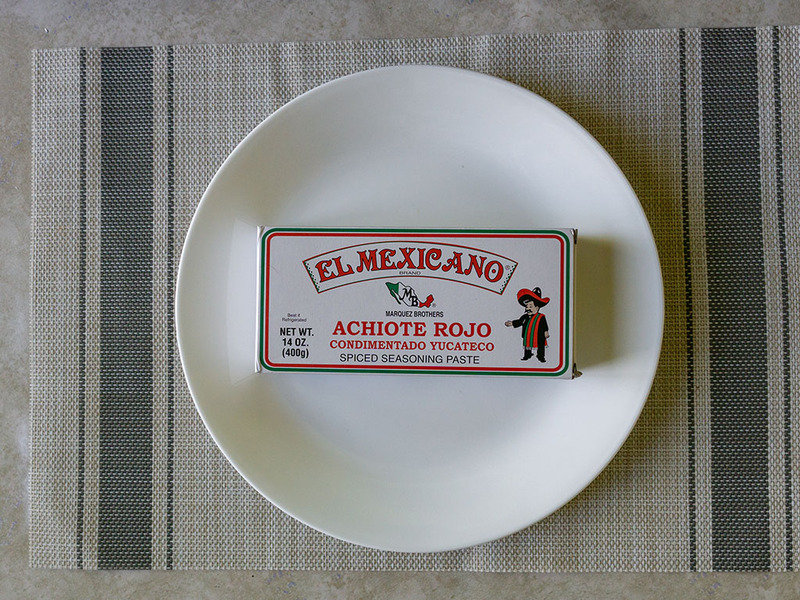 You betcha you can, eat two if you want. 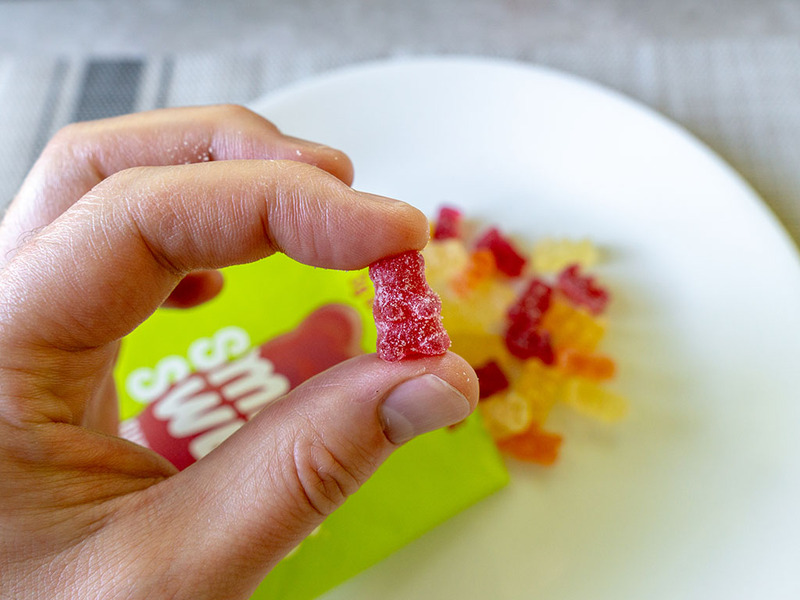 Heck, these gummies are even 100% vegan friendly too. Scroll down for more info, but each bag of these gummies packs in an almost implausible 28g of fibre, which is a full days worth of fibre! Those on carb restricted diets will know that you can subtract fibre from carbs in balancing the books which makes one bag of these gummies a measly net of 5-7g of carb. 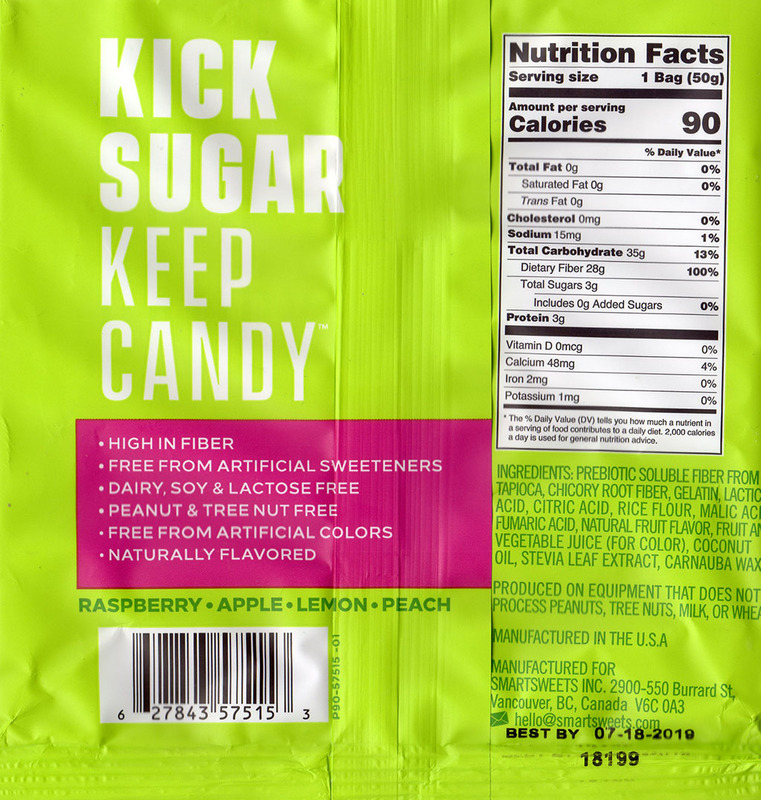 They come in both sweet and sour varieties delivering just 3g of sugar per bag too. 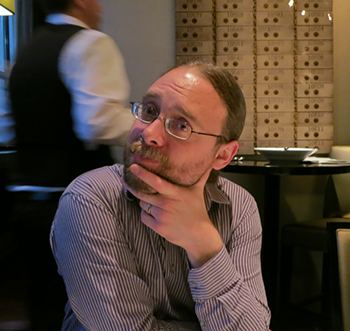 The face puckering sour version was our favorite (pictured above), which comes with a little crystalline dusting, which I imagine imparts the sour flavor. 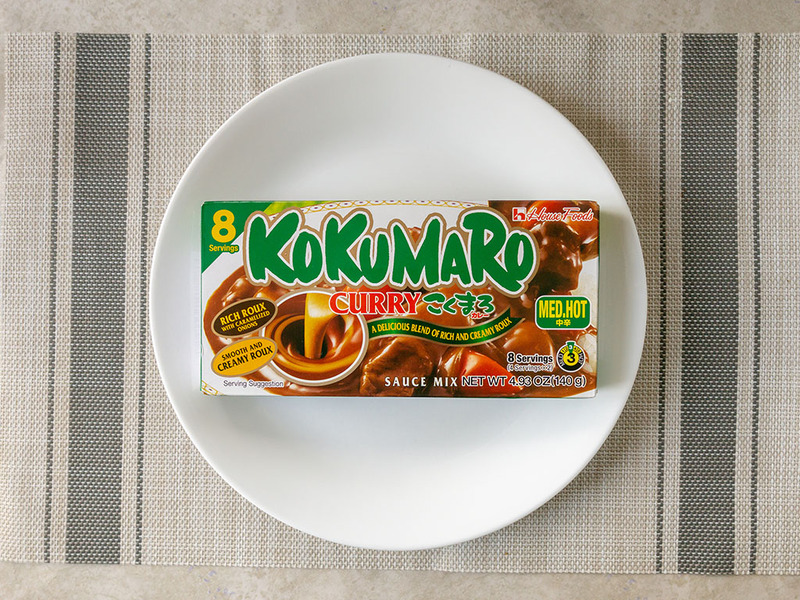 These are slightly more carby as a result, but honestly, when was the last time you ate a full bag of candy and could say you only ate 90 calories in the process? Texturally these are identical to a regular gummy best I can tell and flavorwise these gummies are very cravable too. They’re not as sweet as traditional candies, but they’re close, with only a very subtle after taste reminiscent of artificial sweetening; honestly if I wasn’t trying to sit and carefully analyze each bite, I’d probably never have noticed. If you pop these like proverbial candy, you’d likely never notice you were eating a diet focused product. 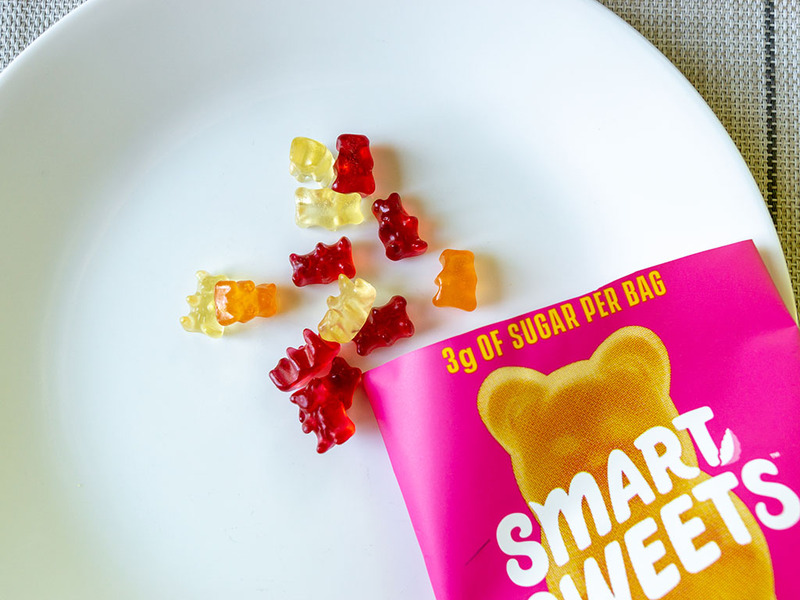 Smart Sweets Gummy Bears – what’s a fair price? All of this doesn’t come cheap. 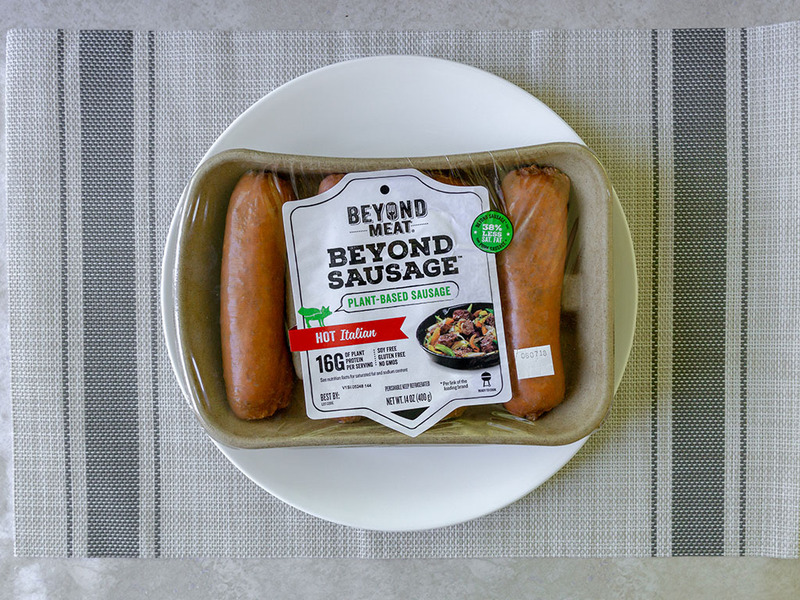 Full disclosure – I received several bags of this product free for tasting and testing – but should you stop by the Smart Sweets website these will cost you roughly $20 or $40 in respective packs of 6 or 12. That works out to $3.30 a bag which certainly isn’t cheap when it comes to candy. That’s the only minor mark against this product. Note: Smart Sweets are also available in select Whole Foods GNC and Target though I am not sure on the respective pricing.